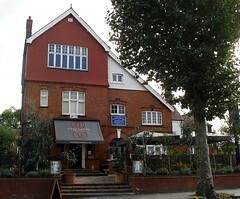 Gastropub just across the road from Willesden Green Station. The front bar is very dimly lit, even in the daytime, as it gets very little natural light. Red tealights glow on the tables in the evening. The dining room further back is better lit, and indeed has one wall covered in a couple of dozen framed mirrors of all shapes and sizes, to make the most of the light; chandelier-style lighting completes the look. Separated from the main dining room by a bead curtain is a small semi-private room with a large round table seating around 10 people. There's a good-sized drinking patio out the front, too, floored with decking and equipped with patio heaters, though there's also the more environmentally-friendly option of borrowing a blanket from the chest just inside the door. Kake visited on a Thursday lunchtime in October 2009. Although a blackboard outside advertised a "selection of real ales", careful inspection revealed that it also said "coming soon" in small writing, and indeed the bar was devoid of handpumps. Lagers on top included Kirin Ichiban and Red Stripe, but I went for the Aspalls cider (£1.85/half). There was a reasonably-sized wine list written on a blackboard on the wall, including around 10 by the glass. Although they have a normal a la carte menu photo, the only menu visible on my visit was the lunch menu, which (according to a board outside) is served noon-4pm Monday-Friday. I went for the Queensbury fishcake with spinach and sorrel cream (£8) photo. It wasn't bad — the spinach wasn't overcooked, there was evident fresh dill in the fishcake, and everything was seasoned competently — but the fishcake itself was huge and barely fried at all; it was rather like eating a mound of salmon-flecked mashed potato. Decent enough mashed potato, and decent enough salmon, but not really what the menu led me to expect. At least it was obviously made in-house. Music was playing; it was all a bit perky (Flashdance, I'm In The Mood For Dancing) and didn't feel very lunchtimey. There were only about half a dozen people in at lunchtime, though when I popped in again later that evening (7pm), all the seats in the front bar were taken and the patio was fairly full too. Service was OK on both visits, though in the evening they did that cheeky thing at the bar where they put your change on a little tray to encourage you to leave a tip. Accessibility: Several steps up to get in, though it's all on one level once you're in. Last visited by Kake, 1 October 2009. Opening hours taken from the Queensbury's Facebook page, October 2009. Last edited 2014-02-16 19:03:47 (version 3; diff). List all versions. Page last edited 2014-02-16 19:03:47 (version 3).